The Disadvantaged Business Enterprise (DBE) program secures equal opportunities for businesses by providing support to small, women-owned, or otherwise disadvantaged businesses. The Nevada Department of Transportation (NDOT) needed software to help run their state DBE program, and Zee Designs provided the perfect online solution. The DBE Manager has both public-facing and administrative interfaces. The public can access vendor listings to verify DBE certification. 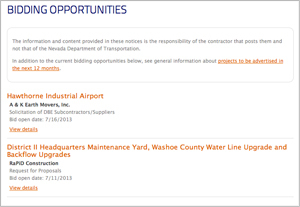 Contractors with bidding opportunities can sign up directly on the NDOT website and share their opportunities with vendors. The software performs “smart matching” to determine the best potential fits between bidding opportunities and vendors, and notifies vendors via email when relevant opportunities become available. NDOT staff can use the administrative interface to manage all aspects of the software. Vendors can be imported from external spreadsheets. Bidding opportunities can be reviewed for relevance. Reports and queries can be generated to gain insight on what’s going on. The wording of all email notifications can be customized without programmer intervention. 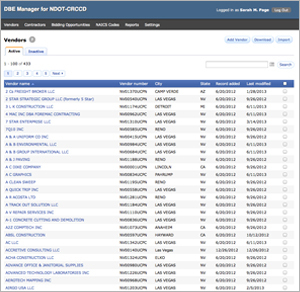 For over ten years, Zee Designs has worked with NDOT to continue building and refining the DBE Manager. The software has grown from a simple vendor listing to a multifaceted and robust online solution that handles essential functions for the department. 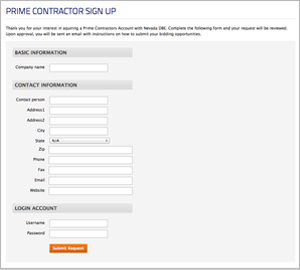 Hundreds of vendors and contractors are tracked through the system.